SUNY mascots face off for "Mascot Madness"
Are you a student or alumni of a SUNY school? Maybe you just want to show off some local college pride? 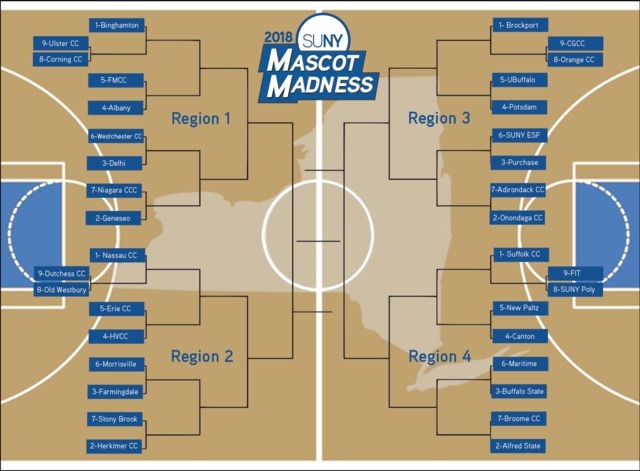 The 6th annual SUNY Mascot Madness brackets are live. You can vote for your favorite mascots right now on the SUNY blog . The schools are ranked based on the number of athletic teams they have. It's all just for fun, but SUNY says the mascots work so hard to pump up crowds, this is our opportunity to cheer them on and recognize their hard work. So take a minute and cast your vote for UB's "Victor E. Bull" and Buff State's "Benji" and any other mascot that strikes your fancy!